Going to the dentist is not high on most people’s lists of things to do. In fact, some people outright dread or fear going to the dentist. Unfortunately, this dread is compounded when you have to get a serious procedure done such as dental surgery, a root canal or tooth extraction. While these kinds of procedures aren’t common, there are many reasons why someone might need an extraction. Luckily, modern dentistry is improving every day like any other industry, and even difficult or expensive procedures like this are becoming more routine all the time. If you haven’t been to the dentist in a while, are experiencing pain or are researching an upcoming procedure, our guide to dental extractions will tell you what you need to know. One of the biggest problems in dentistry is similar to the one affecting medicine in general. It is a compounding issue where someone intentionally or unintentionally neglects their oral health. For some, it can be a financial issue while others have a fear of the dentist that they cannot overcome. Unfortunately, this can lead to a situation where they don’t go for regular checkups, and small issues like cavities turn into significant issues that require more stressful, painful or expensive procedures. Otherwise, life can sometimes happen and unintended issues like accidents, trauma or disease can change your oral health to a point where extraction is required. There are also situations in growing adolescents where teeth must be extracted as a preventative measure to ensure their oral health is improved moving forward. If a cavity is allowed to grow unchecked, it can hurt your tooth past the point where even a root canal can save it. In these cases, extraction would be required to protect the rest of your mouth. In situations where significant trauma has occurred to a tooth or multiple teeth, an extraction might be the only way forward. This is common in scenarios such as car accidents or sports accidents. Sometimes children’s mouths are not perfectly shaped in conjunction with their teeth. Your child or teen’s orthodontist might decide to remove a tooth so that the remaining teeth can fit properly in their mouth, resulting in a straighter smile that improves your child’s self-esteem and oral health. This is the most common reason why teeth are removed. Wisdom teeth are typically so far in the back of one’s mouth that there is not enough room for them. They need to be removed to prevent infection. While your child’s baby teeth are all supposed to come out naturally, sometimes one or two of them may not comply. In these cases of impaction, the baby tooth must be removed to prevent issues with the adult tooth coming in. One of the unintended side effects of strong chemotherapy treatments is tooth damage. Patients undergoing chemo may need to have certain damaged teeth removed and replaced with implants. Healthy people can handle something like a cold pretty well. The same goes for dental issues. A small tooth infection will not trouble most people. On the other hand, someone who is suffering serious medical issues that compromise their immune system might need troublesome teeth removed to prevent a major health crisis. 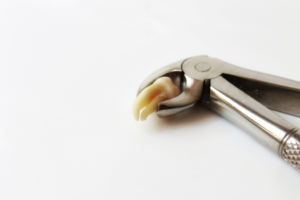 The best thing to remember about tooth extractions is that they are typically the last step. That means that before that happens, they can do a lot of things to save your natural tooth. In fact, if you keep up with regular exams and see your dentist when you think you might have a problem, you can go your whole life without ever needing an extraction. If you haven’t been to the dentist in a while or if you just want to go in for a checkup, contact us at Hassey | Do Duy Dental Associates. Our experienced and professional staff can help with your dental needs whether it’s something as simple as a cleaning or a dental extraction.